This Waterman is a "Safety" which means the nib goes in and out of the barrel when you turn the button at the back of the pen. 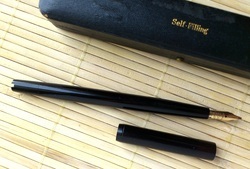 No cardridge or sac here, to fill the pen use an eyedropper to put the ink directly in the barrel. 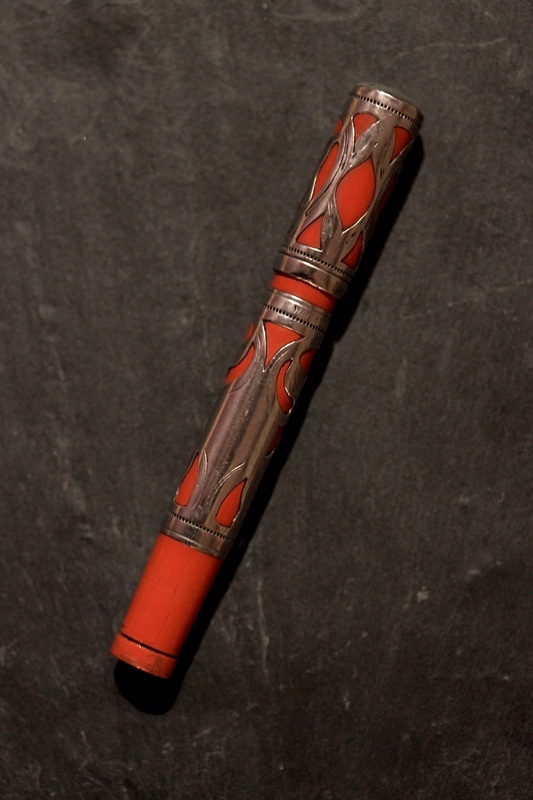 - First, the red hard rubber used for this pen is much rarer than the black, mottled or "ripple" one. - It has a sterling silver filigree. - The nib turns when it goes in and out. Rare all smooth silver (no hard rubber at all) with hand engraved indicia. French pattern with lines and barley corn. These are other 42 1/2 V, most of them with french overlay. From left to right : Ripple, black chased with two 18k gold rings, sterling silver "damier", gold plated "damier", rare 18k solid gold filigree night and day over ripple, and a rare gold plated "godron"
Two Waterman 42 ripple and one 42 1/2v ripple. A very nice find of ... my mother ! ... with other french safety (see in the french pens section). 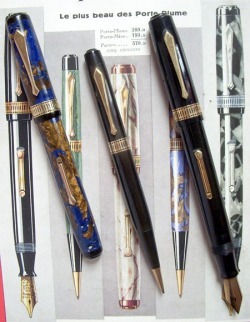 One Waterman 42 has two 18k solid gold rings added for the french market. The second one has a sterling silver clip with initial. 42 .. 42 1/2v ... what does this mean ? The first number "4" means "safety pen" (the nib goes in and out). 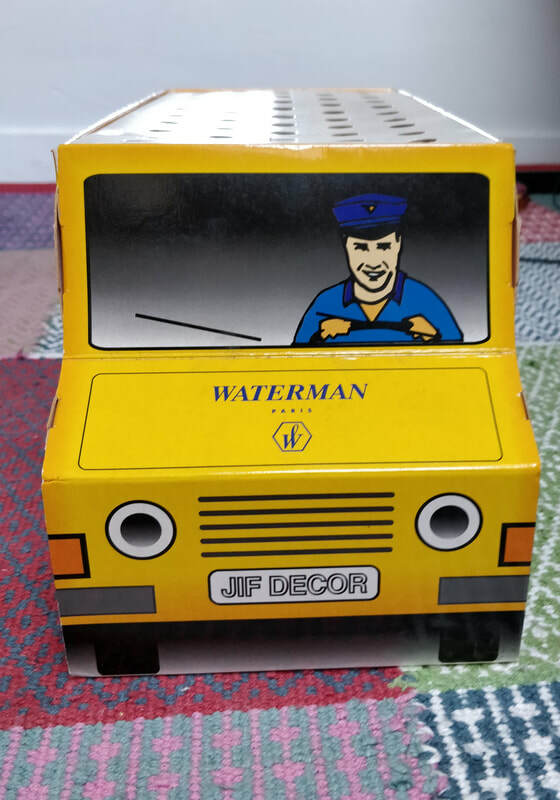 This JIF Waterman catalogue is not mine. Thank you Jean Marc for your authorization to show it here. Jules Isidor Fayard (JIF), was the Waterman distributor in France. 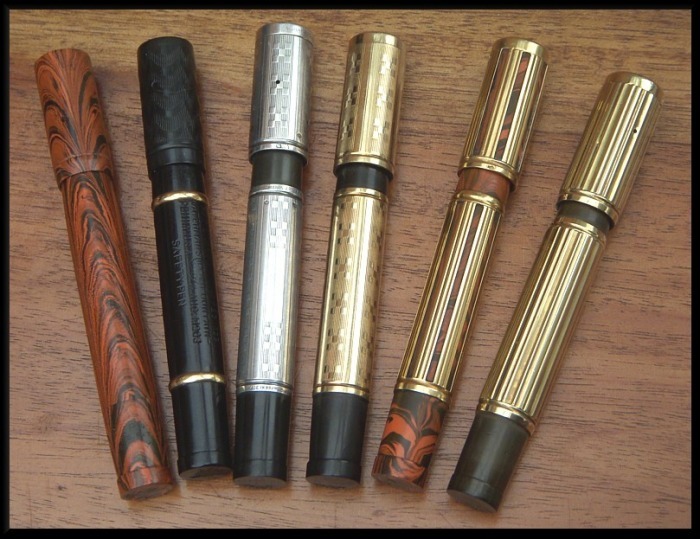 He produced specific overlays based on hard rubber Waterman fountain pens as well as pencils under the brand JIF. 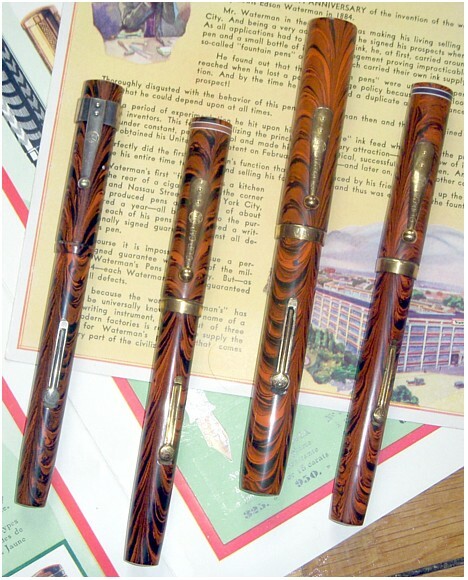 These pencils were available with the same overlay design than the fountain pens and could be sold as sets. This catalogue and the fountain pen catalogue below are in mint condition. Really two great findings ! 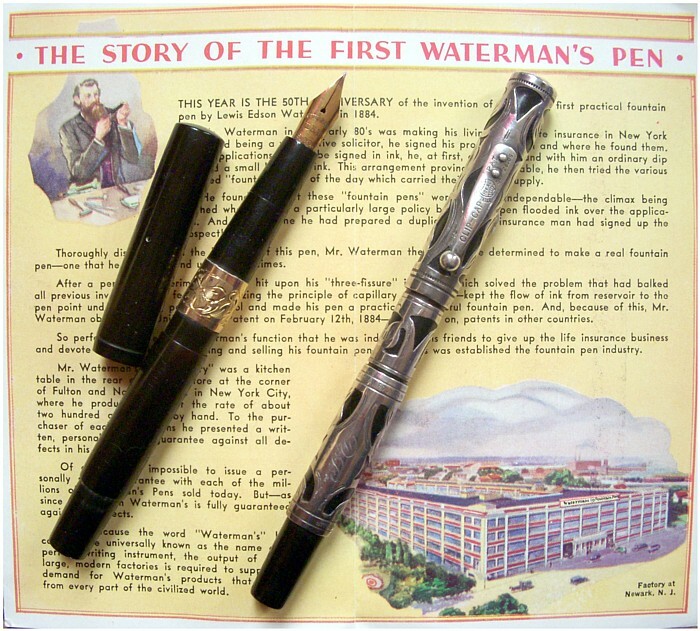 The number 20 is the biggest pen ever made by Waterman. This one is made of black chased hard rubber. It is in a fantastic shape for its age ! It is an eyedropper filler. Considering the size of the pen, he can certainly hold ink for one month of writing ! This pen also exists in smooth black hard rubber, mottled hard rubber, and cardinal (red orange) hard rubber. It could have a sterling silver filigree overlay (N°420). 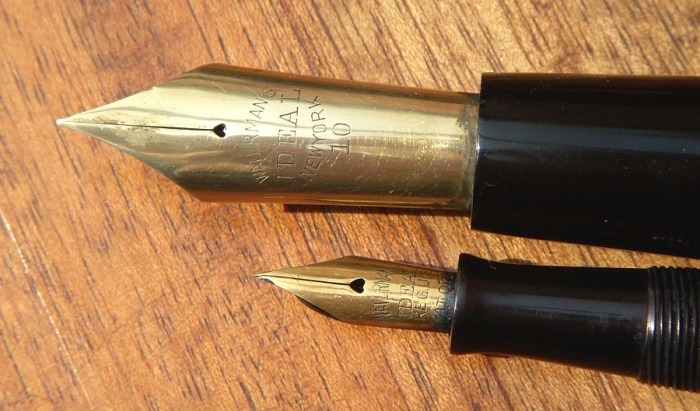 The nib is also the biggest Waterman nib. Number 10. A really stunning pen ! This pen was sent to me from Australia ... in a bubble envelope ! I still don't know how it arrived without any crack or damage !! This set is really a beauty and is very difficult to find in good condition, without dings. It is a late sterling silver overlay, lever filler. 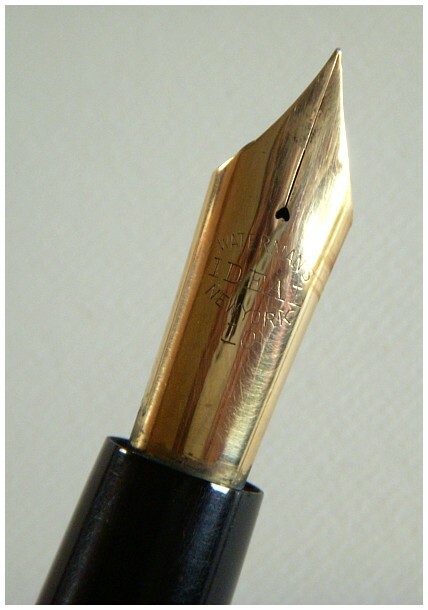 The nib is a Number 4 with a key hole vent. I don't exactly know why this pen is so rare. 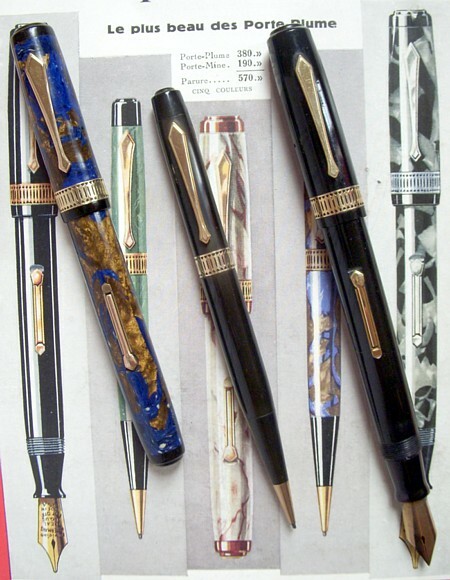 Certainly because in 1939, most of the pens were in plastic or celluloid with vivid colors. It was the time of the Waterman hundred year, Sheaffer balance, Parker Vacumatic. The 494 Bay Leaf, made of hard rubber and sterling silver reminds more the waterman filigree of the 1920's. It certainly didn't meet the success. Another nice and interesting set in sterling silver. 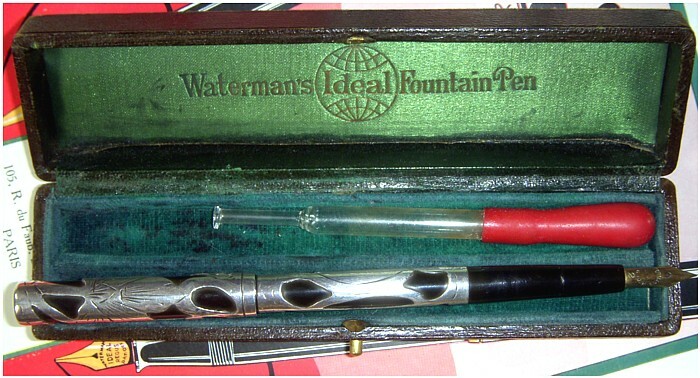 One of the rarest Waterman's US overlay models. Also called "Night and Day". I really like this simple pattern. This model only exists in the 454 size (not in 452). It is a lever filler. The pencil is also very difficult to find. 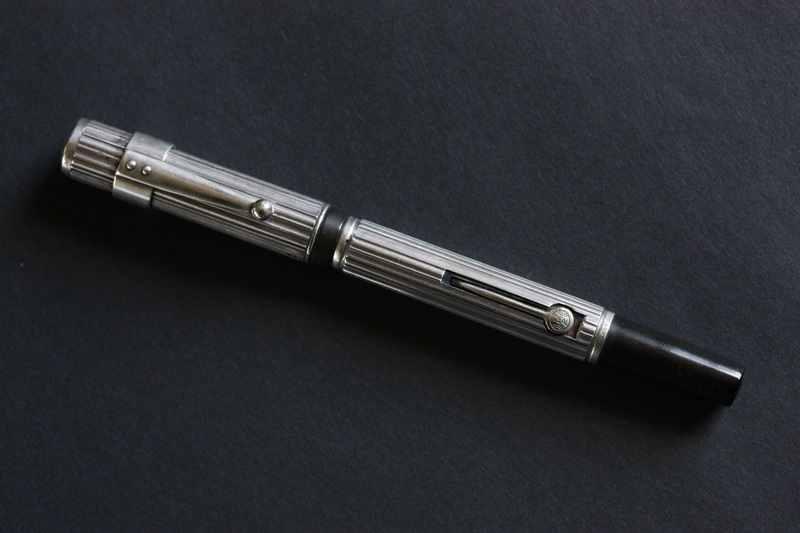 It has a removable sterling silver clip and a waterman ideal N°2 nib. Two ancestors. Both are eyedropper fillers. Very slim pens, the taper cap looks like a dip pen when the cap is posted on the back of the barrel. The gold plated rings are nicely decorated with flowers. This is a comparison between the 24 and 26. They have the same lengh but the 26 is more fat. 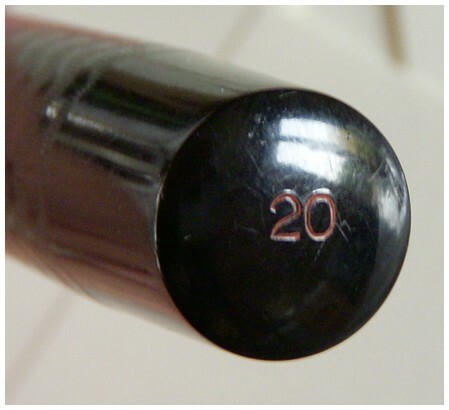 The 26 is fitted with a number 6 nib. This big size is not easy to find. This is a number 14 in mottled hard rubber. I like the dark color of this material and the good size of the nib. Very simple pen, eyedropper, slip cap (no thread). The funny story is that i bought it as a black hard rubber version. 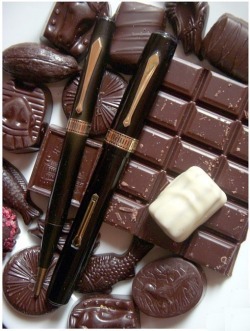 When i received it, it was brown as most discolored black hard rubber pens. 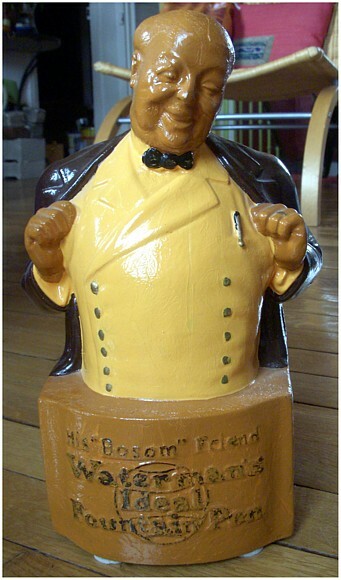 But when i started to restore it, i realized it was a nice mottled hard rubber ... much interesting ! This pen is very long and very thin. I think it is also called stenographer as it could hold more ink to write more pages. 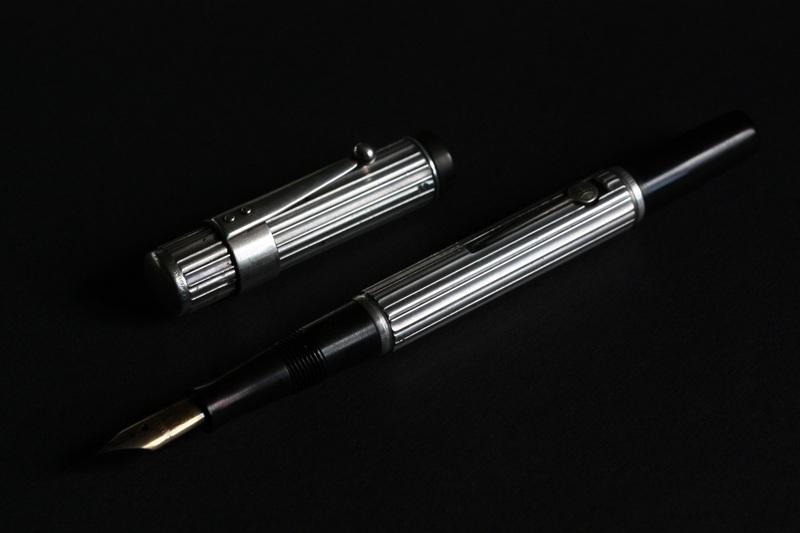 It is an eyedropper with a N°2 nib and a white metal clip. Rare pen. 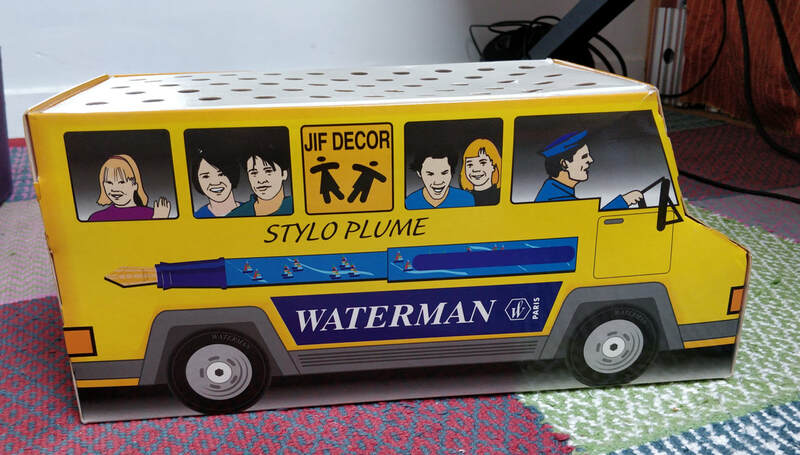 Interesting and quite rare Waterman made in France by Jif Waterman. It is presented here on an original december 1932 advertising published in "L'Illustration" (french magazine). The pen is clipless. 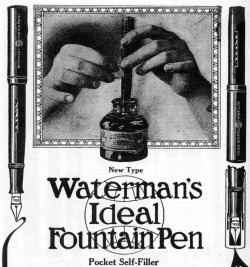 The nib is a number 4 Ideal Waterman, made in USA. The pen was made in different patterns and materials : solid gold, sterling silver and gold filled. 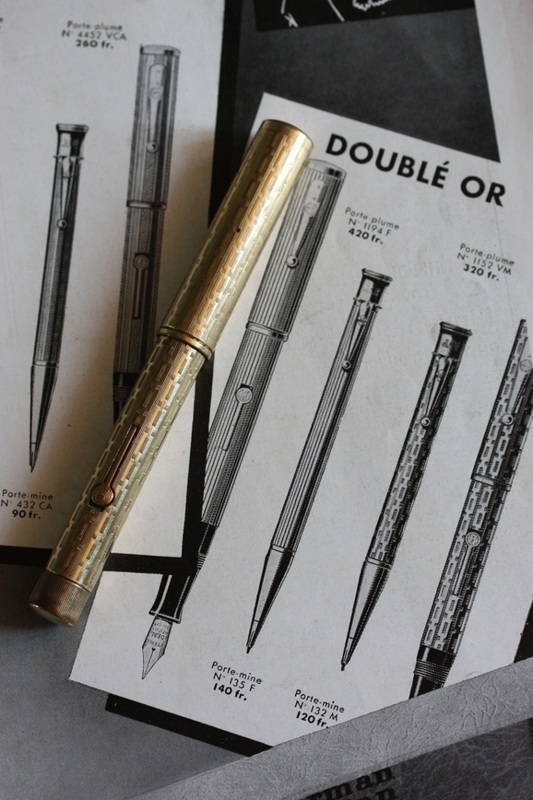 Interesting to see on the same advertising that the price of this pen was 420 francs (in the lined pattern) and the Patrician fountain pen in black and pearl was 380 francs ! 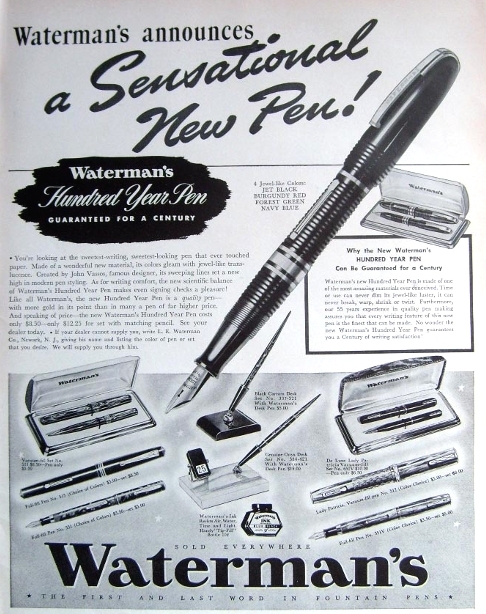 We can also see on the ad the typical Jif pencils which were available in many patterns and materials and sold with the Waterman Fountain Pens in France. This pen has a simple design but is interesting for its filling system. This is a "Pump Filler". 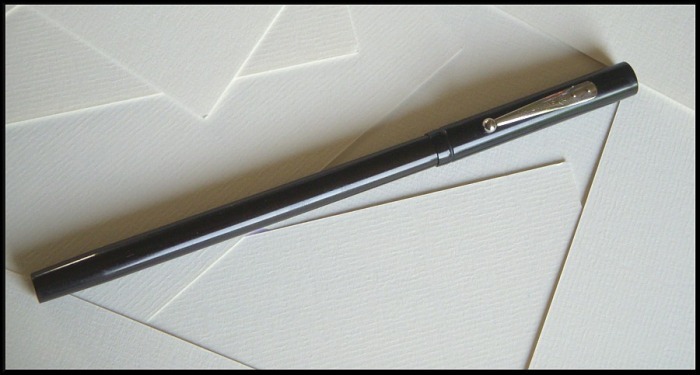 There is a little piston at the back of the pen which will fill the barrel with ink when you push and pull it into the barrel. This pen is quite rare as it was only produced for two years around 1908 and 1910. The "sleeve filler" is an interesting filling system. The sleeve on the barrel moves to show a pressure bar and the sac. Then you just have to press the bar with your finger to fill the pen. See picture below. The 412 SF is sought after by waterman collectors. This pen is mainly interesting for the material. Red Hard Rubber pens are much more rare than black or mottled ones. Moreover, this is quite a big size (number 6 nib), which makes a very interesting pen. This is a lever filler, with gold filled lever, cap ring and clip. The biggest size for Waterman lever fillers is 58. 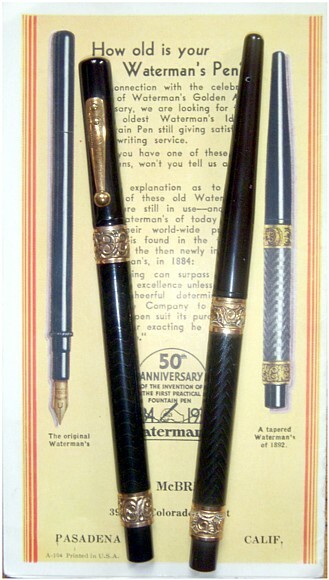 This is the first version of the famous Waterman Hundred Year. This one is in red color but it also exists in black, green and blue. I really like the design of this pen. Lever filler. Nice big "hundred year" nib. 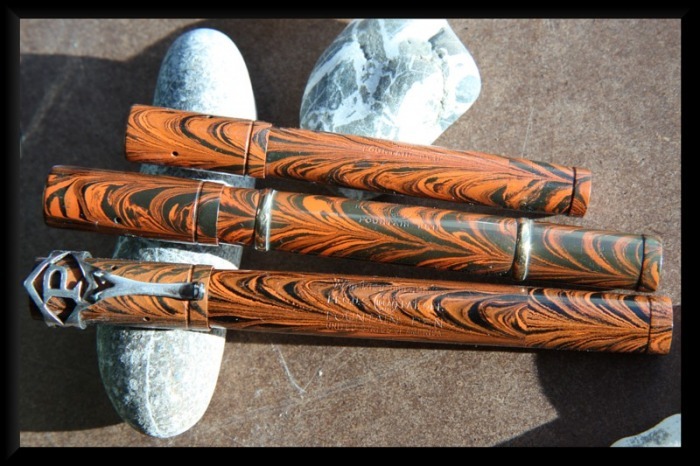 Recently, Waterman made the "Charleston" inspired by this fountain pen. Same fountaine pen as above but in Forest Green. Look the transparency of this material. 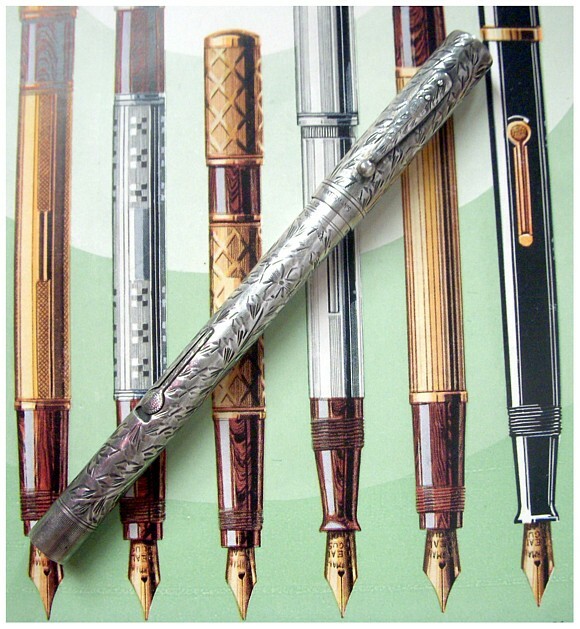 The big flexible nib is engraved "Waterman Hundred Year Pen"
This Art Nouveau Waterman has a nice filigree with a big flower on cap. A lot of different Art Nouveau filigree versions exist. This one comes with its box and eyedropper. 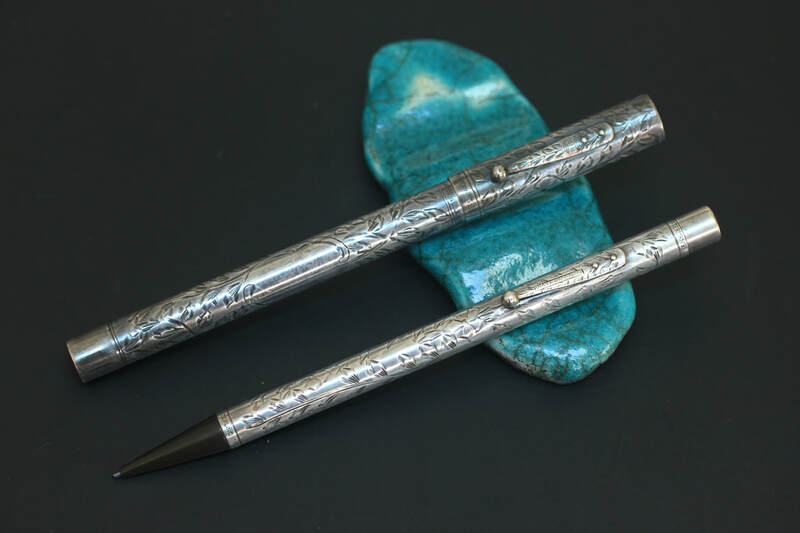 You will read in all fountain pen books that the Patrician, and mainly the Patrician turquoise is the most beautiful plastic pen ever made. And ... it is certainly right ! 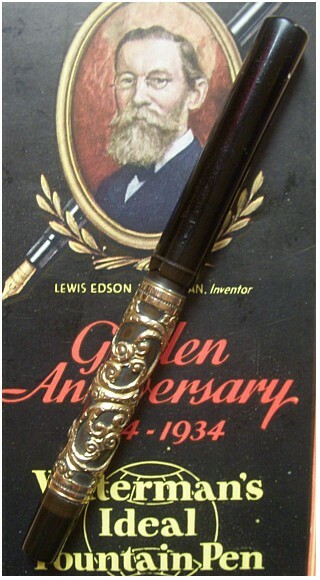 This pen is made in a fantastic material, the specific clip, cap ring, lever, gold capsule "ideal" at the end of the barrel and ... huge and beautiful nib, all these details make this pen is actually a beauty. That's why all collectors are looking for it ! 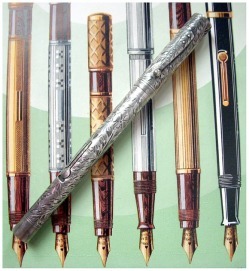 It is not really a very rare pen but it is more and more difficult to find in perfect condition. 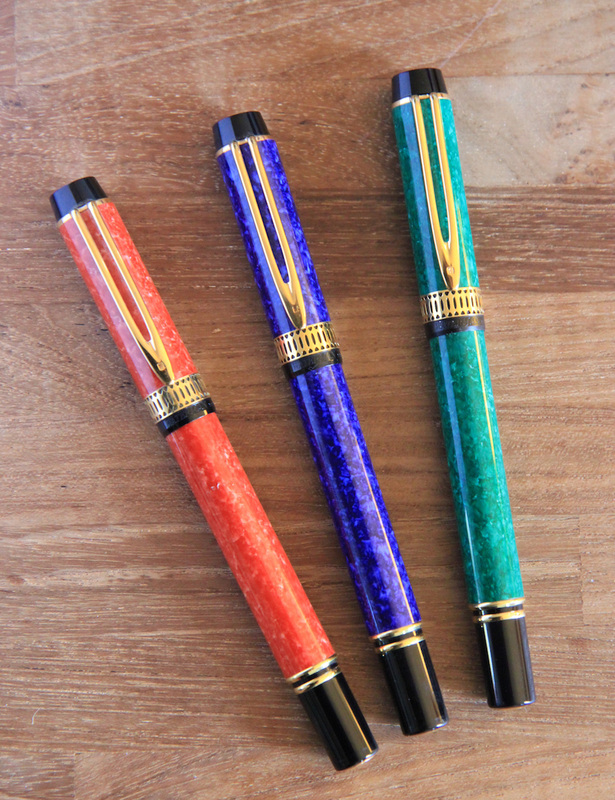 Some colors, like the onyx (red and cream - see below) or the jade green (see it in the "other rare pens" part of this site) are actually very difficult to find with no discoloration. 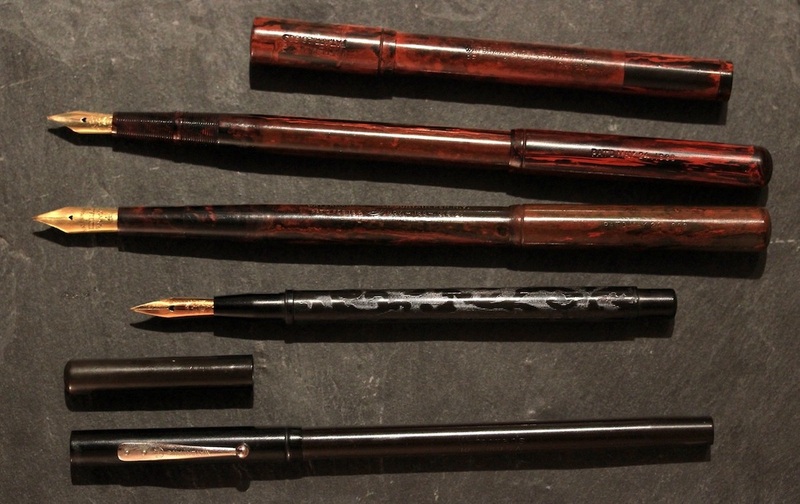 Like all fountain pens, any discoloration will clearly decrease the value of the pen. The black exists in three versions : plastic like this set, hard rubber, and hard rubber with a different cap band. This set is one of the most beautiful Onyx Patrician i have ever seen. The onyx color is very difficult to find with no discoloration. 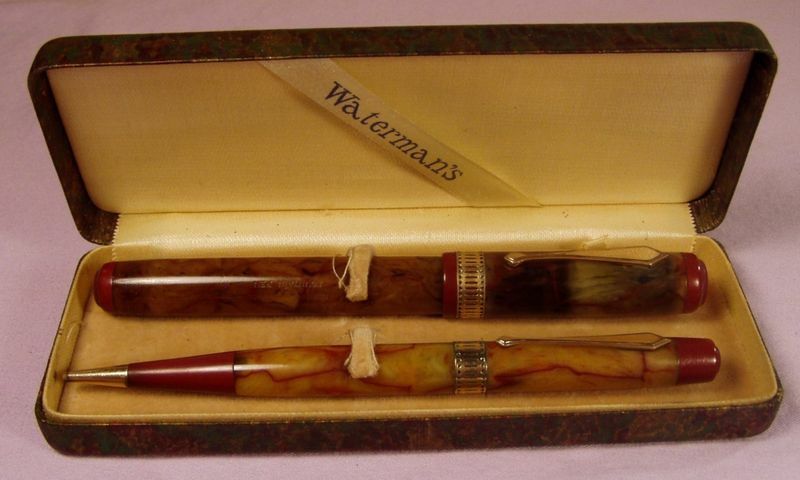 The box is also a very rare Waterman item in such a good condition. These three pieces were found separately. A great opportunity to buy a ... @&!#§%$!! I cannot help myself to show you this set for comparison. 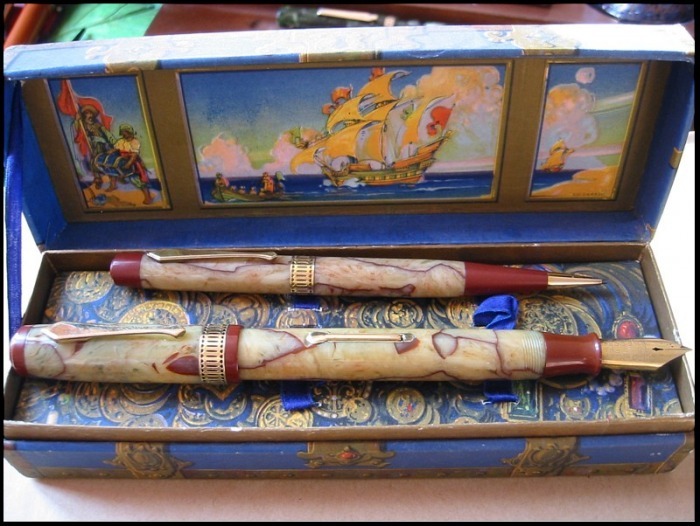 "1928-38 WATERMAN ONYX CREAM & RED PATRICIAN FOUNTAIN PEN & PENCIL SET IN BOX - SUPER CLEAN NEAR MINT ONYX WATERMAN PATRICIAN SET,BOX"
Wow ! Near mint !!! ... this set should have the same color than the above set ! This set is in fact totally discolored but sold as "Near mint" and "very clean condition". No indication about the color ! The buyer paid 688$ for this ... "beauty" ! If you want to buy a Patrician but do not want to spend to much, i think it is really better to buy a nice black Patrician than a rare but discolored and ugly Onyx. This kind of set is just good to be used as parts provider or as a daily user for the quality of the nib, but at a much lower price. 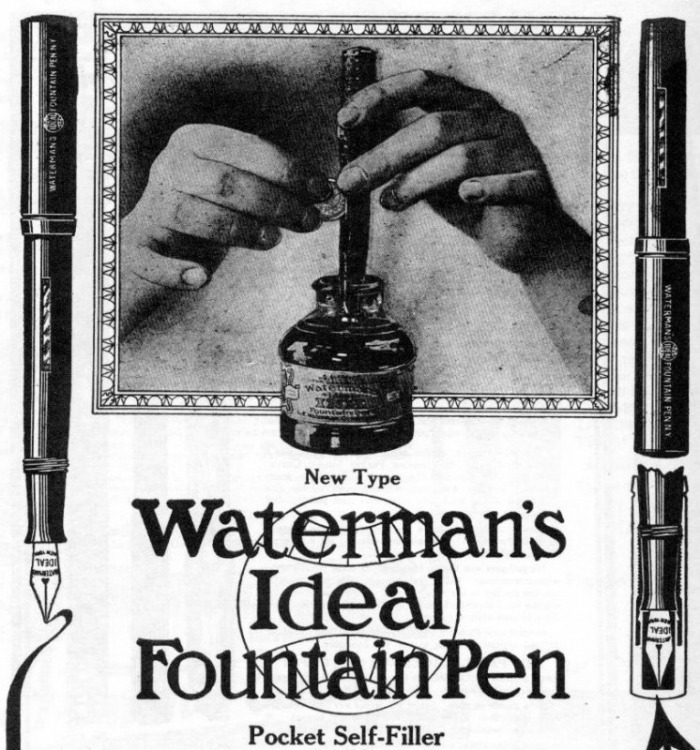 In 1992 Waterman launched a specific version of the well known "Man 100". This is the Patrician which reminds the famous line of the 1930's. Two details come directly from the old Patrician : the cap ring design, and the little gold plated "ideal" logo at the extremity of the barrel. Unfortunately the nib is the standard Man 100 nib. - Lapis Blue: it reminds the old "Turquoise"
- Emerald Green: "it reminds the old "Jade Green"
The Onyx color and the Black haven't been reproduced. - the "Codex" dedicated to spanish and portuguese markets: it is a Man 100 Patrician (blue or red) with a sterling silver filigree on cap and barrel. Personnally, i do not like this version at all. 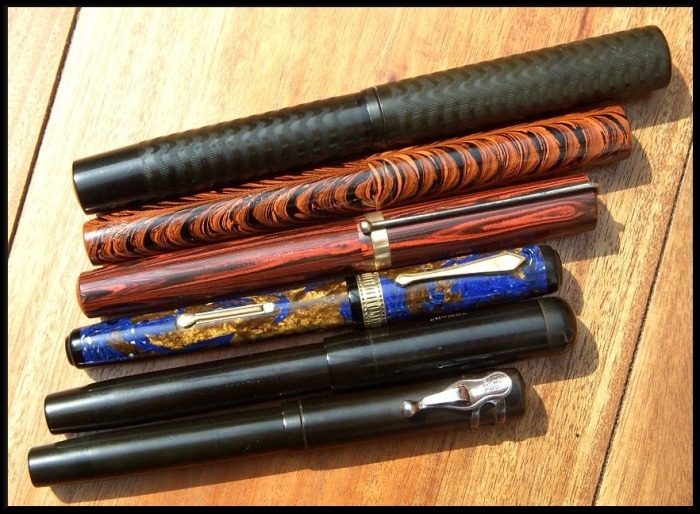 From left to right : Waterman 52 bandless, waterman N°7 purple band, Waterman 58, Waterman N° Pink band. 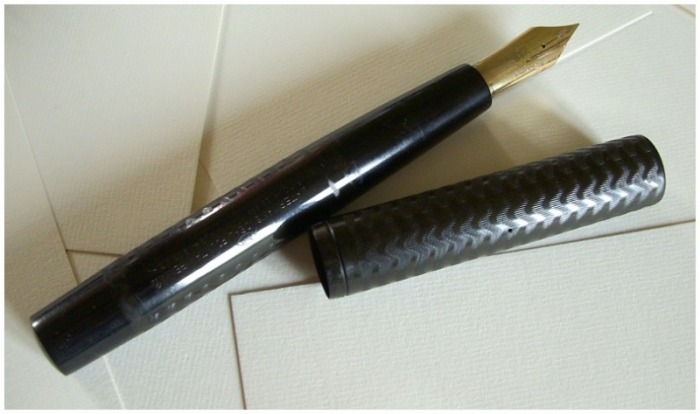 The ripple is the name given to this specific design of the black and red hard rubber of Waterman. 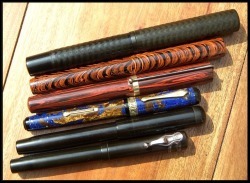 Waterman made many different pens with this material. The "58" is the biggest lever filler made by Waterman. It comes with a huge 8 nib. 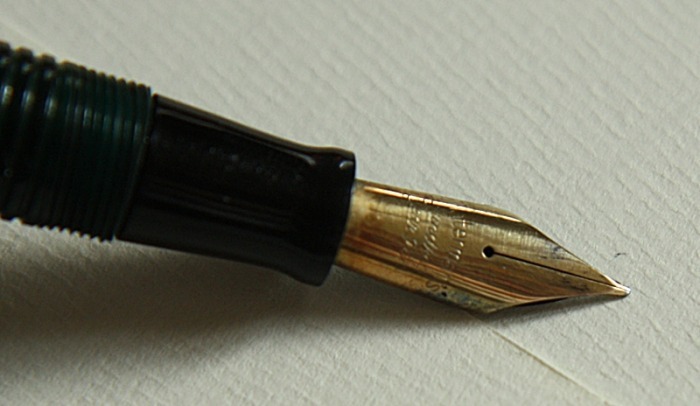 The number "7" have a color band at the top of the cap, indicating the type of nib for this pen. For example, "pink" means "flexible". Depending of the color, the value of the pen is very different. The "black" one is very rare. 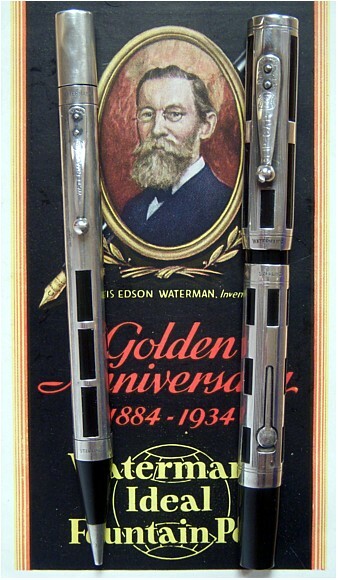 Identical to the above Waterman 58 ripple. This one has a bandless and clipless cap. The barrel is engraved "Ripple" and "United states of America". This version was made for the french market. I was quite lucky to find this pen as the hard rubber color is still in perfect condition and is not restored ! 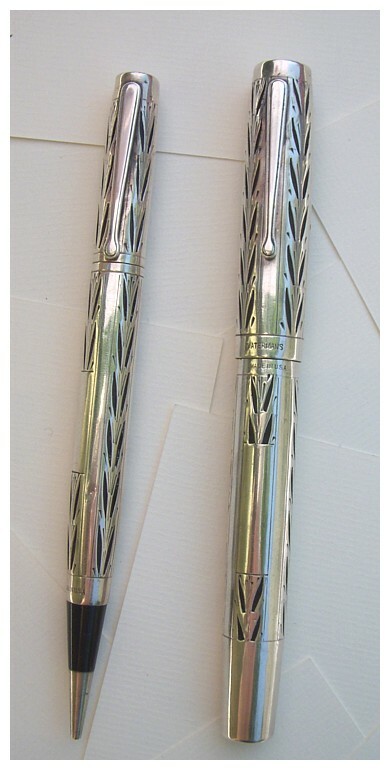 This pen is an eyedropper with a nice filigree on the barrel. It has a N°4 nib. 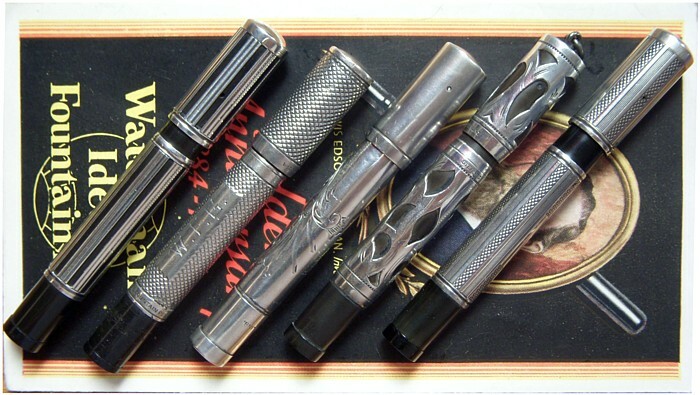 It is quite elegant and reminds me the design of the Parker "33" (see in Parker section). 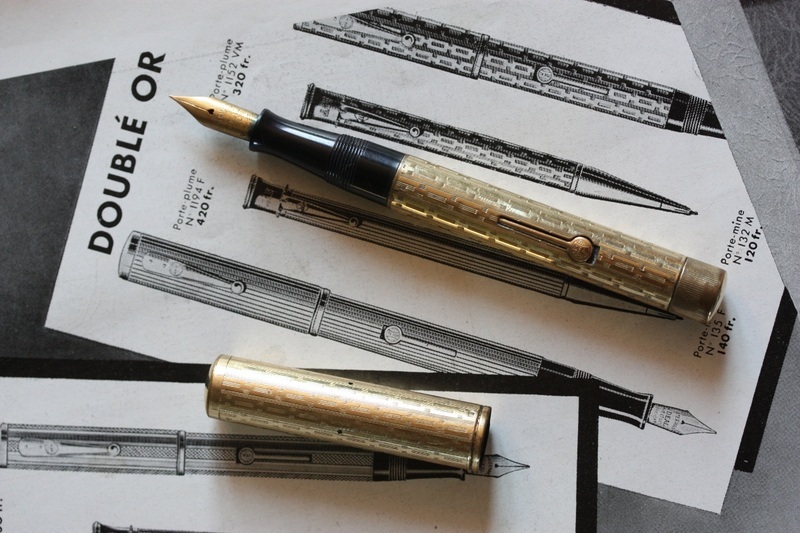 The "92" is a very well made pen with several interesting details. 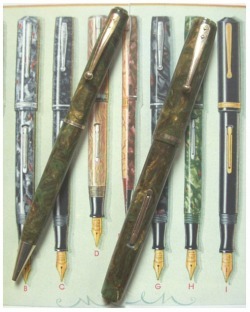 Waterman used very nice materials on this model, like this green and bronze color. The most beautiful is certainly the red and bronze. I only regret waterman never used these material on oversize pens. The "92" is a long but slim pen. Nice color for this waterman. Lever filler. Nib N°4. This one is in near mint condition but this model is very often discolored. 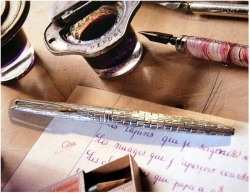 The CF (Cardridge Filler) is one of the most famous Waterman modern pens. 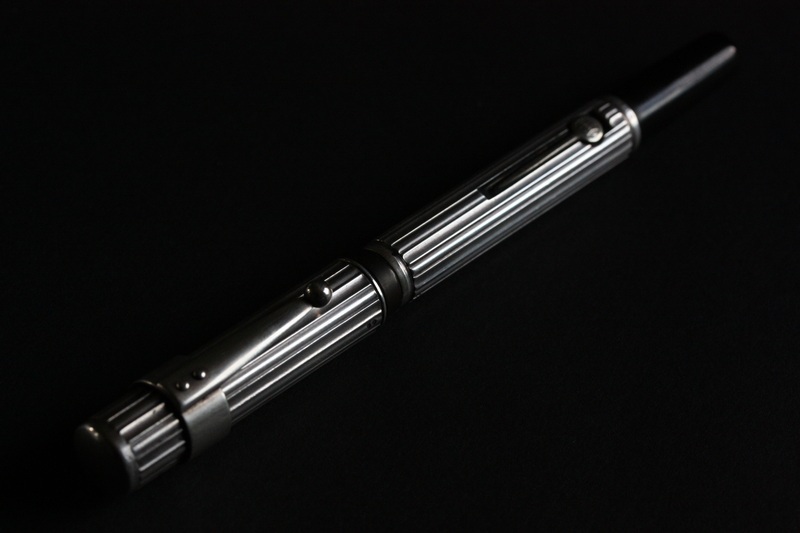 It is a quite small and thin fountain pen. Its nib has a very specific design. 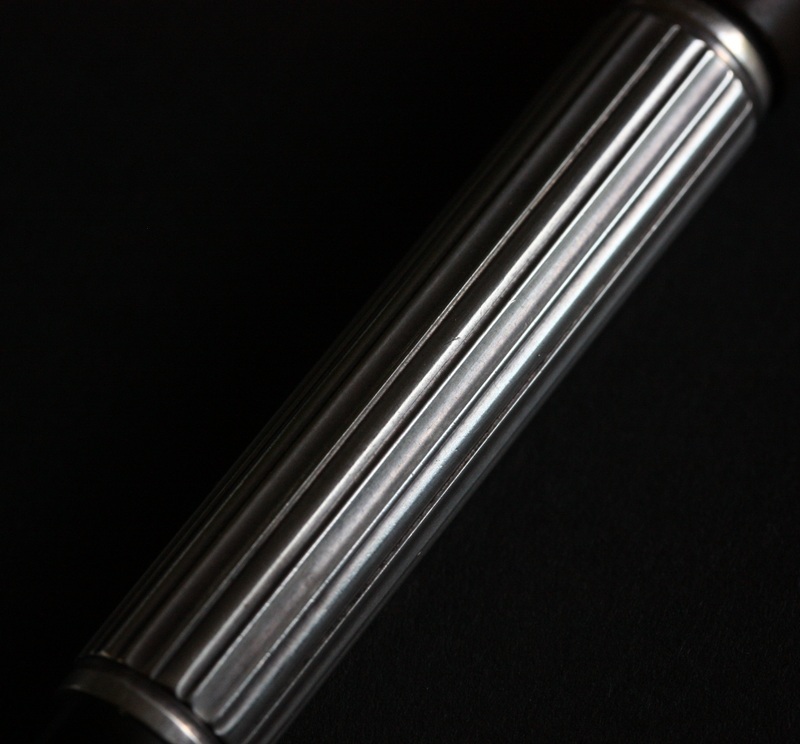 This pen exists in many different patterns, colors and materials. This one is in sterling silver with a pattern called "crocodile". Is no longer in the collection. The Edson line appeared in 1993. The first version was blue with a gold plated cap. 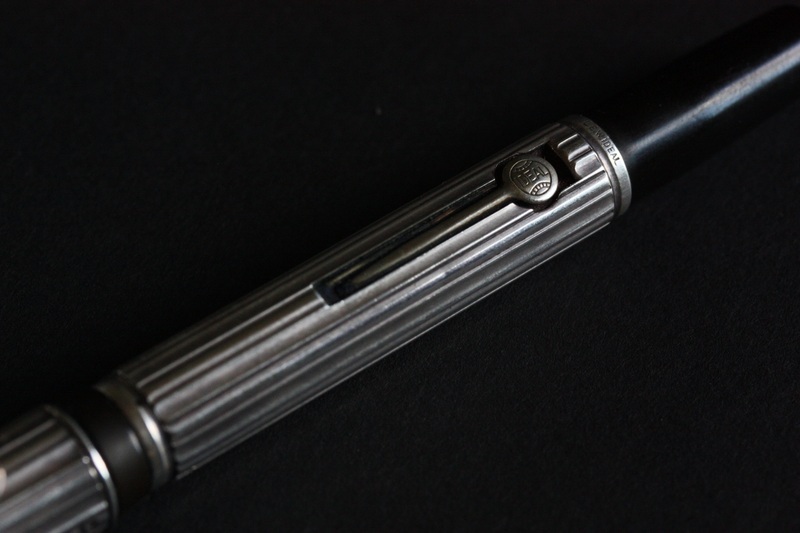 Very modern with a really innovative design even if we can say it reminds the Waterman CF. The first color was a deep blue with some transparency. Two other colors came later : emerald green and ruby red, still with a gold plated cap. The "Diamond Black" appeared in 2008, with a black barrel, section and a platinum plated cap. 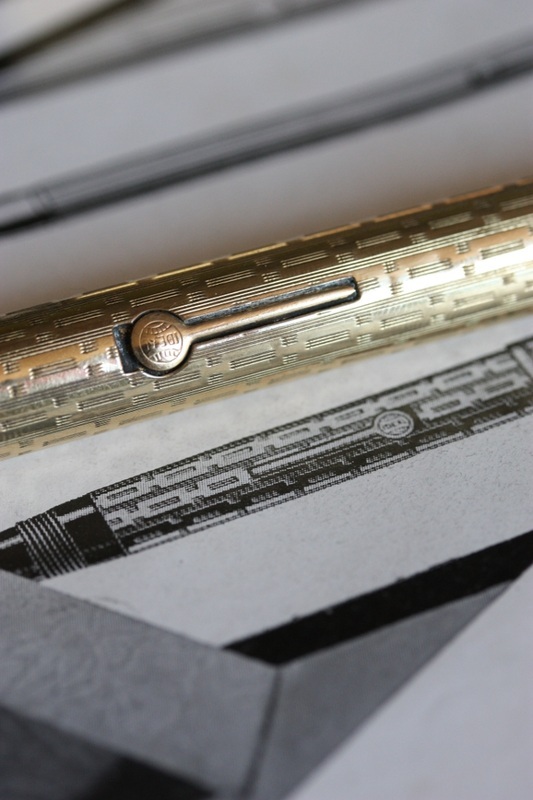 Two other limited edition exist : the Edson "Boucheron" made for the famous jeweler (3741 pens), with a solid gold filigree on the barrel (very discreet ! ☺ ). 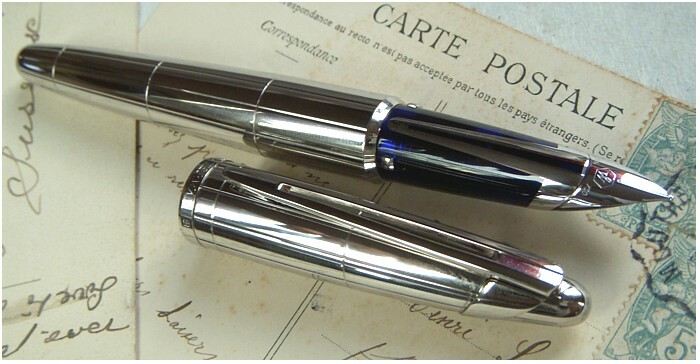 The "Edson 125 ans" was produced for the waterman 125th anniversary with a blue lacquer and palladium body (1883 pens). The Waterman Serenité was introduced in 2000. As for the Edson, the curved design was innovative. 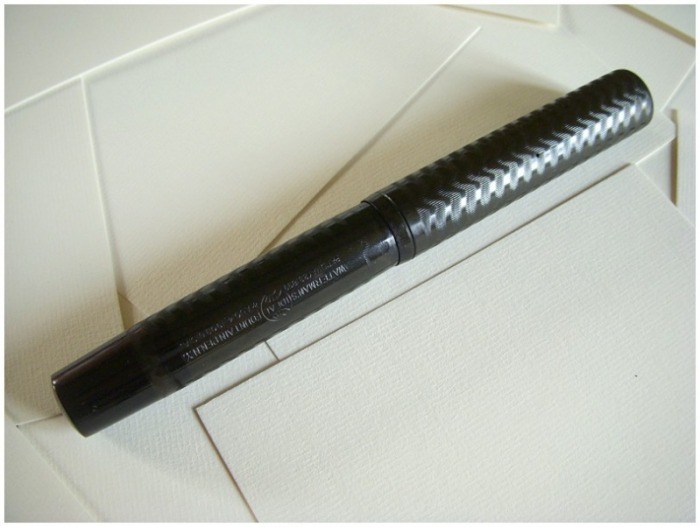 The first version was made in black plastic with a wide sterling silver ring looking as a rope wrapped around the pen. 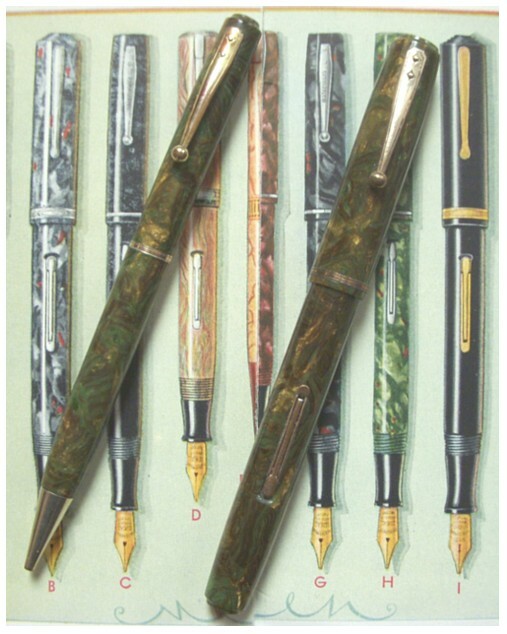 A limited edition in coccobolo wood was produced in 2002 (3000 pens) with a different ring. 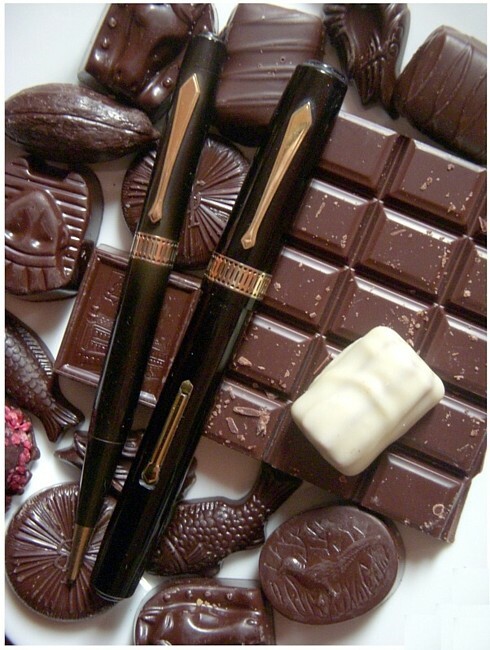 The one i have is the same fountain pen than the limited edition. 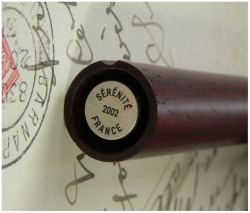 This pen is engraved "Sérénité 2002 France" where the limited edition shows the number of the pen. Maybe a seller sample or a prototype. 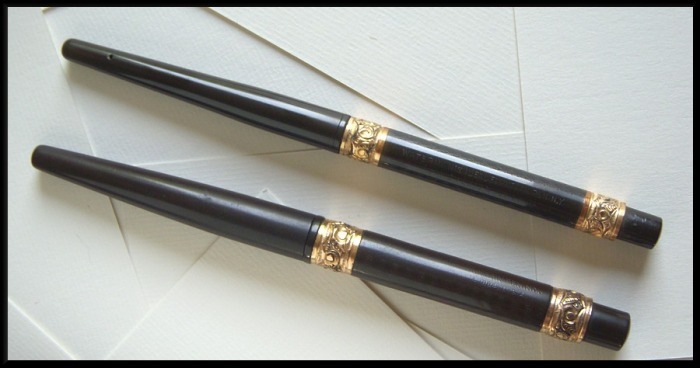 For me, one of the most beautiful pen made by Waterman. I found this store display in a stationery shop of the south of France around 1996. 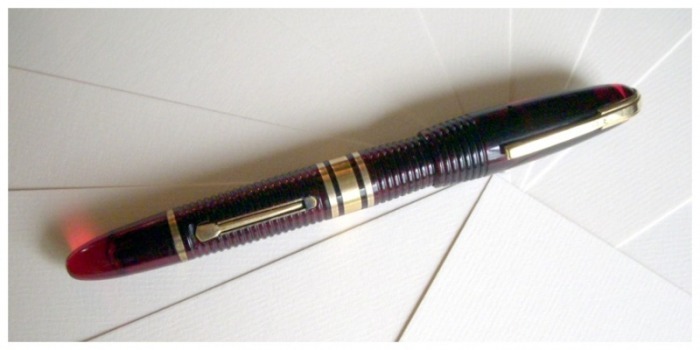 ​It was used to display a low cost waterman fountain pen for school.